PORT ST. LUCIE, Fla. (AP) Even before Steven Matz had a shaky spring training debut, it had been another bumpy day for the New York Mets. Eager to put last season’s rash of injuries behind them, the Mets have instead been slowed by various ailments this month under new manager Mickey Callaway. The Mets said Tuesday that slugging outfielder Yoenis Cespedes was out of action because of mild shoulder soreness. The team also said ace Jacob deGrom was feeling stiffness in his lower back. Then in the third inning against Houston, reliever Anthony Swarzak, who signed a two-year contract with the Mets in December, left the field with two outs after covering first base and committing an error on a soft toss from Adrian Gonzalez. Swarzak’s short sprint – his second of the inning to cover the bag – resulted in a left calf strain. The right-hander will have an MRI on Wednesday. ”I just felt something grab a little bit in my calf. I continued to run and walked off the field, some good signs. It wasn’t a situation where I had to hit the deck and pray for the best. It was nothing that serious whatsoever,” Swarzak said. Callaway said the minor injuries are simply a product of the staff being overly cautious. ”The things some of them have, they’d be playing right through during the regular season. It doesn’t make much sense right now to push it because we have plenty of time to get them all ready,” he said. 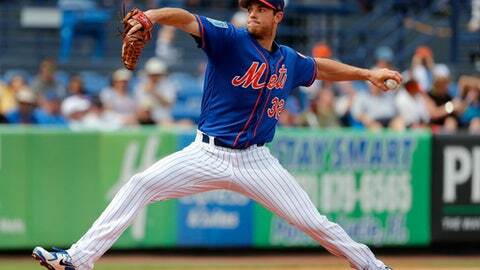 Matz’s problems were more related to his results. The left-hander worked a perfect first inning before failing to record an out against the five Astros he faced in the second frame. He allowed five runs on three hits and two walks. ”I feel healthy and I feel good, so I’m going to build off that and kind of visit some things in the next few days and build off the outing,” said Matz, who left Max Stassi’s two-run, bloop single. Matz said he didn’t know how he suddenly lost it in his 36-pitch outing against a Houston lineup that sported just one starter, Evan Gattis. ”It’s hard to say at this point,” Matz said. ”It’s frustrating, but it’s February and this is the best I’ve felt in spring training in a long time, just physically,” he said. ”I was really excited coming in to camp, so that’s the frustrating thing when you get results like that,” he said. Last year began to unravel early for Matz, starting in camp. He was the only left-hander in the Mets’ rotation as he hoped to play his second full season after a strong 2015 when he was 4-0 in six starts and a 2016 rookie campaign when he went 9-8 with a 3.40 in 22 starts. But Matz had elbow tenderness last March after four spring starts and was shut down. He came back and made 12 starts, but irritation due to an ulnar nerve issue led to elbow surgery in August. His season with the Mets ended with a 2-7 mark and a 6.08 ERA in 13 appearances. Now, the Long Island native finds himself alongside another lefty likely to wind up in the rotation, Jason Vargas, who tied for the big league lead with 18 wins last year with Kansas City. The 26-year-old Matz said he’ll try to put the rough outing behind him. ”You’ve really got to overlook it at this point. It’s really about that I’m healthy and I’ve got to build off what I felt out there,” said Matz, who added he felt good out of the windup and not as much from the stretch. NOTES: OF Jay Bruce, who has missed time with plantar fasciitis, made his spring debut as the DH and went 1 for 2 with an RBI. ”It went fine. I felt good. It’s progress, for sure.” Bruce said his foot issue will be a ”housekeeping deal” where he’ll have to monitor it and stay stretched out. He and the Mets agreed to a three-year, $39 million deal last month. . Tim Tebow made his spring debut as the Mets DH in the sixth inning and went 0 for 2 with a strikeout and a flyout to left. . 1B Dominic Smith had his MRI on Monday, which revealed that he has a right quadriceps strain. . The Mets travel to play Atlanta on Wednesday. RHP Matt Harvey will make his first spring start and be opposed by RHP Brandon McCarthy.